The blue-grey is going up as I type. 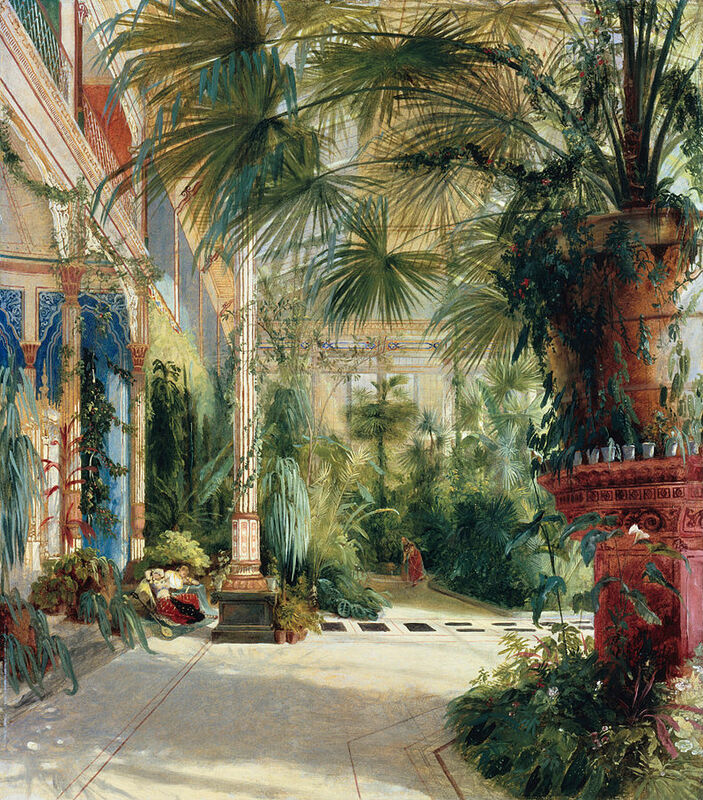 The blank space in it is for the Palmeraie (wall)paper after Carl Blechen. 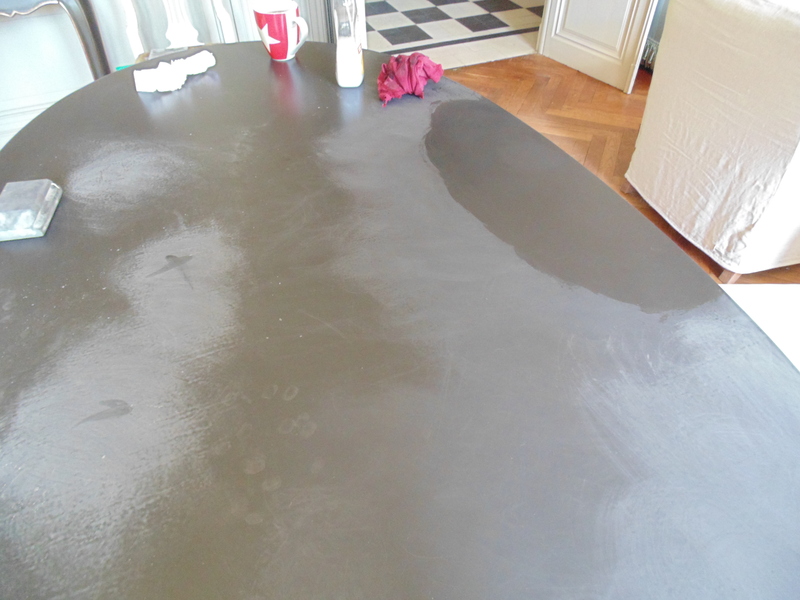 I’m in the last stages of the ebonising of the table. I decided to go with a wax finish, which is — of course — the hardest to do. But the nicest to the touch. The table gets a lot of use in this house so it’s important to get a respectable result. Mike’s been doodling with pergola designs as we’ve decided one is going over the terrace. Unopiu makes beautiful things but unfortunately nothing anywhere near the size we need, so ours will have to be made to order. We’ve used a local Mazamet artisan before for the coffee table in the Red/Zuber room and we’re using him for the pergola because we’re extremely happy with the quality of his work. We’re basing the design on the Unopiu Solaire, though double the size. Mr. Bouzac will also be going with more solid and sturdy ironwork and we’ve asked him to make the decoration a bit more sophisticated than the one below. That baby blue actually works. Nicely done. Will you live in it when done? Or is this one of the things you do? 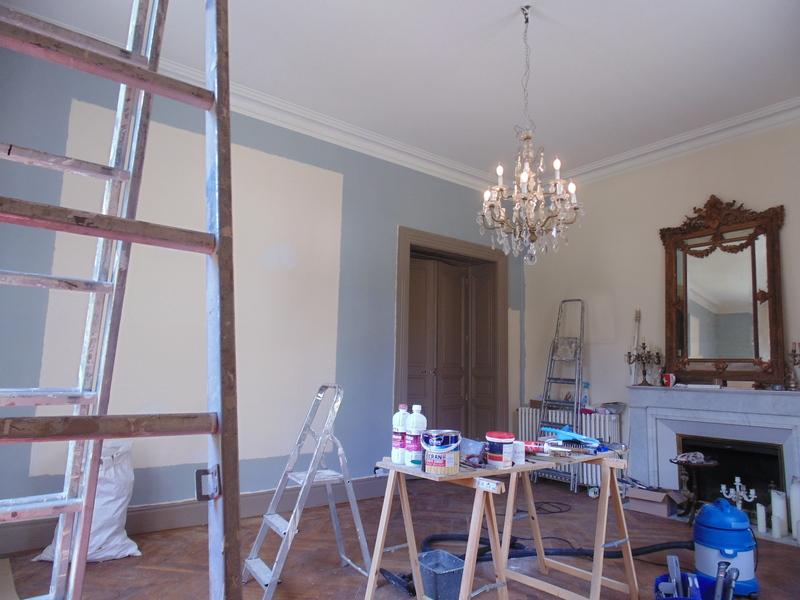 Fix up a place, sell and find a new project? Excited to see the dining room in its entirety. Man that pergola and garden space is going to be fantastic. The height and structure will really cement it as a “space”. Thanks! Another week or two and it’ll be usable – not quite finished but at least *in service* which means I can finally take the dining table out of the grey room. 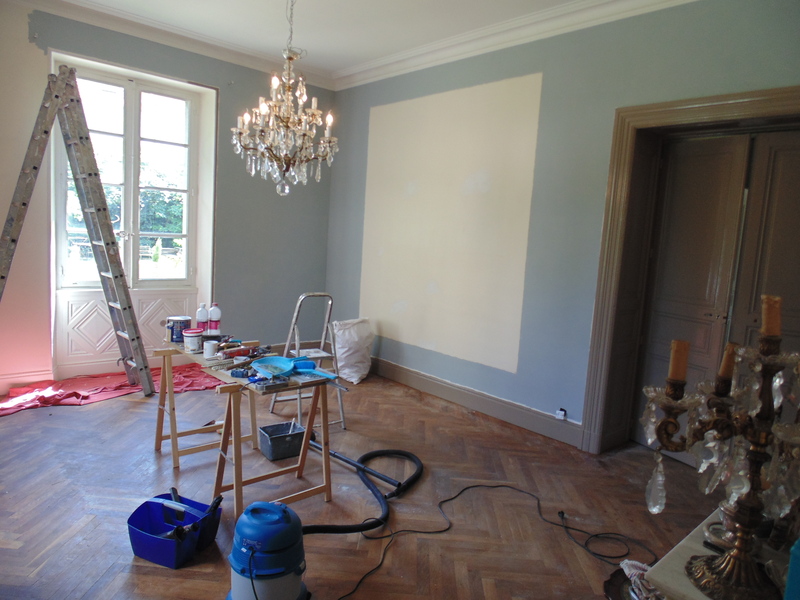 I really like the Noisette color on the woodwork, really nice, it’s just a perfect color. Looking at the picture of the patio (or do you call it a terrace?) 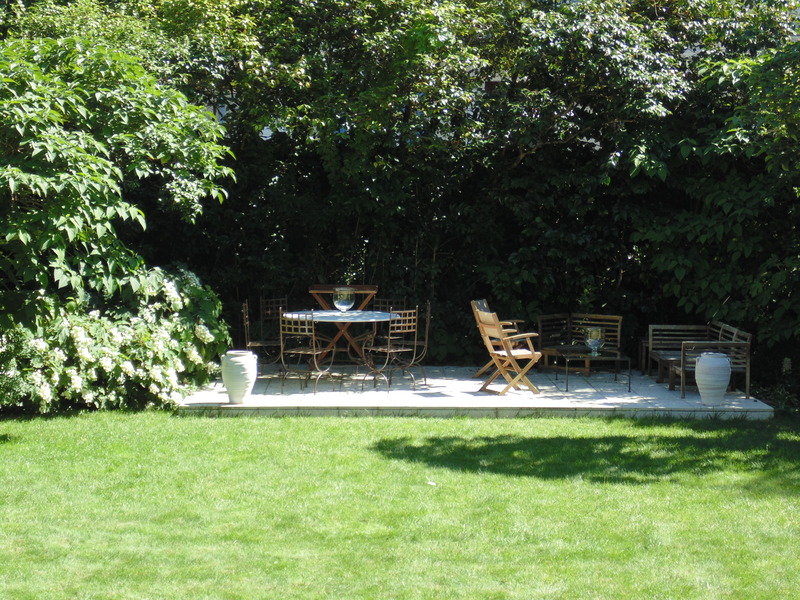 Although nestled in the trees the photo is showing quite a bit of sun on the patio, guessing the trees are north and the front of the patio is facing south, thus the sun bearing down on the patio. Looking at the picture of the model pergola, if you go with that height (it looks quite tall to me) is there a risk of I believe it being set to high and the sun is going to come in just as strong right under the roof covering. Seeing as how you lived in Spain you probably know what I am trying to say, I bet you experienced that there. I’m sure I am not being clear but basically patio roofs that are set to high, end up not providing shade. Perhaps you are not looking for shade anyway but just more of a structure? If looking for shade I would run some tests to see what height and angle the roof should be to provide shade. If it were me I would bring the structure out into the grass area if I was going for shade protection. Goes along with my more is always better personality, ha-ha-ha. Are you looking for shade protection? The other thing you could do is have him fabricate some type of fixture on the four corner posts so that one day you could fasten some lighting fixtures to the posts, doesn’t have to be electric, could be battery operated decorative lanterns. Of course overhead lighting is preferable to wall lighting but as long as you are getting is custom made why not add something on the corner posts for future use? He might just drill some holes at equal heights dropping down from the roof line, with those holes one day you could add pegs to hold stuff. Maybe you want to display some artwork in the pergola some day and suspend it on the corner posts. It is much easier for him to drill those holes when he has the iron bars laying down flat in his work area before welding them into a structure form. Are you looking for shade protection? When you use this area in the summer is it hot by you? If so you might look at a sandwich roof, and in between the sandwich is insulation this will really keep you much cooler than simply a thin covering strictly for shade. It all depends on what your goals are. You could make your own sandwich roof if he builds it with this specification. Underneath the roof is your typical wooden branches that you buy on a roll this is the ceiling you see from sitting on the patio looking up, paint a 2″ Styrofoam boards brown, then another layer of the wooden branches on a roll, on top of the insulation. He could frame that out to hold that. It just all depends on what your goals are and what you are trying to block. Maybe in your area you want the speckled sunlight coming through because it doesn’t get that hot by you. I love the noisette too! Mike was protesting until this morning,saying it was too dark, but now he’s okay with it. Is the table the same paint (color) as the woodwork? Okay now I gotta go look up ebonising. Btw, are you going to ‘frame’ the wallpaper at all? This entry was posted on July 22, 2018 by The Pink Agendist in design, gardens, Mazamet and tagged design, interiors, Mazamet.